Just a couple of days ago, I wrote a review of Axel’s Chain Reactions, a beautifully illustrated tale about a boy that doesn’t quite fit in. In that review, I mentioned that kids should understand that it’s okay for them to be different. Today, I’m going to follow up on that post with a review of an app that teaches kids how to deal with their friends who are different. The app is an interactive storybook called Four Little Corners. The app, adapted by DADA Company from a story written by Jerôme Ruillier, shows what’s it like to literally be the square peg trying to fit through a round hole. 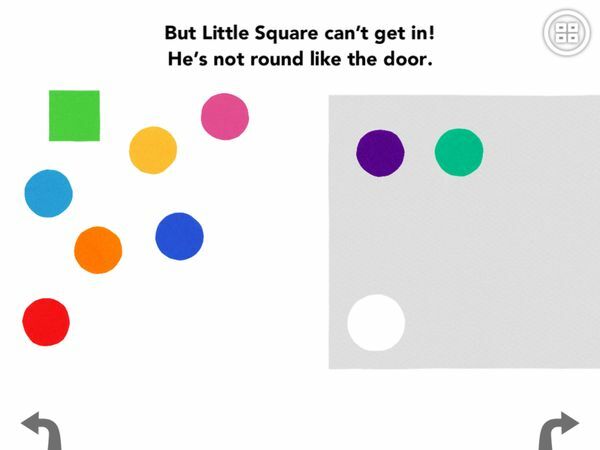 Four Little Corners is a charming tale about a small square, Little Square, who befriends a bunch of small circles, the Little Circles. They all play happily at first, until it’s time for the shapes to go inside the house. As the shapes enter the round door one by one, they realize that Little Square won’t be able to go through. The Little Circles tell Little Square to make himself round, but despite his best efforts, he remains square. In the end, after thinking long and hard, the shapes decide that it is not Little Square that must change -- it is the door. So they cut out four corners from the door, and the story wraps up in a happy ending. Simple and sweet, Four Little Corners is suitable for emerging readers. There is just enough amount of text on each page, and the app includes a professional narration with different voices used for different characters. The overall look of the app is very clean. The illustrations are composed of simple, colorful shapes laid on top of white background. There are interactive elements throughout the story that allow kids to tap and swipe to move the story forward, such as helping Little Square stretch his sides or cutting off the corners of the door. Navigating the app is easy and intuitive: simply use the arrows on the bottom to move forward or backward through the story. Kids can also jump to any page by tapping on the navigator button on the top right of the screen. Parents can rest assured knowing that the app is safe to use. It does not contain ads, in-app purchases, or links. Four Little Corners is available in (British) English and Spanish. Despite its simplicity, Four Little Corners has plenty of charms. The minimalist illustration is something I don’t see often in a children’s app, but it really draws you in. Together with the spot-on narration, sound effects, and animation, it creates a lovely reading experience that kids and adults can enjoy. The story itself is engaging and enlightening without being preachy. There are some valuable life lessons to take away, such as equality, friendship, solidarity, and social integration, that parents can discuss further with their kids. Additionally, kids may use the app to learn about colors and simple shapes. Can the Little Square join the Little Circles without sacrificing his corners? Four Little Corners is a charming tale about friendship and equality, told in a creative way. The story itself is entertaining, and the characters are surprisingly endearing for a bunch of simple shapes. Great animation, music, and narration further add to the reading experience. I would highly recommend this app for kids ages 2–6.